The April 11th edition of The Daily Telegraph gave readers a rare glimpse of one of the most famous locations to have appeared in the series "Danger Man", which starred Patrick McGoohan before he made "The Prisoner". 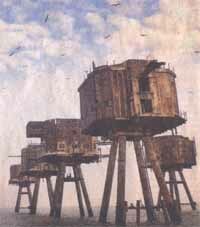 Red Sands Towers, several miles off the coast of Kent in Southern England, were built to defend Britain against a sea-borne invasion by Germany from occupied France during World War II. After the war, one of the towers became home to pirate station Radio 360. It appears that plans are afoot for a £3m restoration of the towers, which the government has decided not to demolish due to the £9m costs involved. The towers are featured in the "Danger Man" episode "Not So Jolly Roger" as a spy station. Thanks to Dave Lally for bringing this news to our attention.